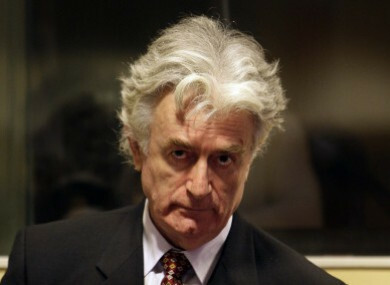 Karadzic (73) was notorious for his role in the 1995 Srebrenica massacre. FORMER BOSNIAN SERB leader Radovan Karadzic has been ordered to spend the rest of his life in jail for genocide and war crimes. Karadzic (73) was sentenced to 40 years in prison in 2016 but appealed his conviction. UN judges in the Hague this afternoon imposed a life sentence. Karadzic was once the most powerful Bosnian Serb politician and was notorious for his role in the 1995 Srebrenica massacre. “I think this verdict is historical for justice,” Munira Subasic of the Mothers of Srebrenica victims’ said earlier today, adding that they wanted Karadzic to get a full life sentence. A former psychiatrist turned political leader, Karadzic was arrested in 2008 in Belgrade after nearly 13 years on the run during which he posed as new-age healer Dragan Dabic. In 2016, he was found guilty on 10 counts including orchestrating a nearly four-year siege of the Bosnian capital Sarajevo. More than 10,000 people died in a campaign of sniping and shelling, according to prosecutors. 22.11.17 Justice for those massacred in a 'safe area': what happened in Srebrenica? Karadzic was also found guilty of the Srebrenica genocide. Bosnian Serb troops slaughtered more than 8,000 Muslim men and boys in eastern Bosnia, which was supposed to be under UN protection, and buried their bodies in mass graves. Karadzic had appealed the sentence on 50 grounds, accusing judges of conducting a “political trial” against him. Email “Bosnian Serb leader Karadzic's jail sentence increased to life imprisonment ”. Feedback on “Bosnian Serb leader Karadzic's jail sentence increased to life imprisonment ”.